Beginning with the Prydain books by Lloyd Alexander and the Earthsea Trilogy by Ursula K. Leguin, Kyra Halland has always loved fantasy. She has also always loved a good love story. In 1990, as a new stay-at-home mom, she finally decided to combine those two loves - like chocolate and peanut butter! - by writing the kinds of romantic fantasy novels she wanted to read. Courageous and complicated heroes, strong, smart, and sweet heroines, magic, romance, adventure, heroism, excursions into the dark corners of life and human nature, and a dash of offbeat humor - all of these make up Kyra Halland's worlds. Now she is pleased and excited to share those worlds with readers, and hopes that others will enjoy her worlds and stories and characters as much as she does. Kyra Halland lives in southern Arizona. She has a very patient husband, two less-patient cats, and two young adult sons. Besides writing, she enjoys scrapbooking and anime, and she wants to be a crazy cat lady when she grows up. 5.0 out of 5 starsThe Lost Book of Anggird has a little bit of everything and is sure to please. No matter the genre you prefer to read, The Lost Book of Anggird has a little bit of everything and is sure to please. The story opens with Perarre, a young scholar at the university. She has been selected to a cherry of a research assistant position working with the esteemed professor of magic, Roric Rossony. Positions such as these are hard to come by, especially for women, and Perarre intends to advance her career to the fullest. Unfortunately for her, Professor Roric proves to be a difficult employer. He is prissy, aloof, and borderline misogynistic. Perarre at first regrets her being hired for the position, but their cold relationship changes as they come to understand one another, and even love each other. It is all the better for them that they start to get along so well, because before long Roric finds himself in a load of trouble. 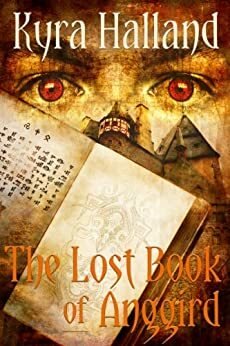 After an accident involving magic gleaned from forbidden books, Roric and Perarre are declared enemies of the state, and the kingdom doesn't stop short of sending the army after the two fugitives. It is here that Perarre and Roric's adventure begins in earnest. The book is an interesting mix of genres. Superficially, it is a fantasy novel -- magic is prevalent and plays an important role in the plot. Dig a little deeper and you'll find it's also an adventure novel -- Perarre and Roric elude the law, all the while searching for answers to why the state of magic in the world is shifting. Look deeper yet and what you have is a romance -- Perarre and Roric are an unlikely couple at first, but they complement each other. Their relationship develops naturally and with good pacing; it feels right and makes for a good read. The author has done a stellar job at painting for us who Perarre and Roric really are: how they live, their fears and aspirations, the parts of themselves they're ashamed of, and their courage. All these factors help us really empathize with the characters, and to evoke this level of empathy in the reader is no small feat on the part of the author. Don't miss this one. It's a good read. Perarre knows exactly what she wants and doesn’t plan on letting anything get in her way. That’s how I like my characters, strong and focused. Though I did struggle at first to understand her attraction to Roric. It took me a while to warm up to him, but by the end, he was my favorite. I love it when authors make me care for characters I initially struggled to like. While this is a fantasy romance, in no way does the romance dominate the book, and that’s the way I like my fantasy. The author’s writing is smooth, charming, and easy to follow. While I did find the opening a bit slow, I’d recommend The Lost Book of Anggird to all fantasy fans. You won’t be disappointed, and I’ll definitely be reading more from Kyra Halland. She’s an author to keep an eye on. This was a very compelling book. I was sucked in right at the beginning and had to force myself to put it down to sleep. I really enjoyed the characters and was sad to have it end. A great read! This is exactly the sort of book I love: a well-conceived fantasy world with an intriguing magic system; some great characters who behave in a believable way; a plot that’s driven more by the background and characters than the need for relentless action; and a strong, satisfying romance. Why can’t all fantasy be like this? Let’s start with the characters. Perarre (no, I don’t know how it’s pronounced) is a woman determined to make a success of her career in a male-dominated world. After a wild phase, she’s settled down to an academic life as a translator of old books, aided by her ability to magically ‘read’ the intent of the author (and haven’t we all read books where we could have used a talent like that?). Roric is the buttoned-up and demanding professor she ends up working for, a man hiding a surprising past. He’s given the task of finding out why the ‘magica’, the tricky to manage magic system, is no longer easy to balance. Something has gone wrong, but finding out what has happened and whether it can be fixed means taking big risks. As the two investigate, they naturally start to see each other as more than working colleagues. This part of the book is exceptionally well-written, as they circle round each other and gradually set aside their prejudices and inch towards an understanding. The romance builds slowly, right up until the point where they hurtle headlong into a passionate affair. The change felt a little bit abrupt, but given their personalities (Perarre’s wild-child past and Roric’s obsessively constrained behaviour), it was believable and I can go along with it. From this point onwards, the pace accelerates to become a breathless ride from one end of the country to the other, and back again, multiple times. I was quite relieved that later journeys were condensed to ‘After a month of travel…’. Nevertheless, the various locations where the pair end up, whether the sophisticated and political big city, the village or small farming community, the isolated woodsman’s hut or the very different society of the nomadic steppe clans, are beautifully described. I never had any trouble visualising the settings and understanding the prevailing customs. Both Perarre and Roric have to leave their old ways behind and open their minds to other cultures (quite literally, in fact). I found it fascinating to watch Roric in particular shed the thick shell he’d built to protect himself from hurt, and face up to both his own heritage and a future very different from anything he’d ever envisaged. This is where the rock-solid love between the two is absolutely critical. And yet he never changes his inner self, and never loses his scientific spirit of seeking the truth, regardless of the cost. There were moments in the second half of the book where I began to feel that the pace was sagging a little, and wondered whether I was being fed a certain amount of filler. But then things would veer sharply off in a completely unexpected direction. I do love it when a book surprises me, and this one has several such moments, much to my delight. The ending is less unexpected, and (to my mind) falls slightly flat, and I wasn’t totally convinced by the oh-so-convenient way the population of the capital city falls into line, but it isn’t a major stumbling block. A very enjoyable read. Highly recommended. Four stars.